Home / Posts Tagged "whitewashing"
Thank you for your letter. Because it raises important questions regarding your perceptions of diversity, we are again requesting a meeting to discuss the casting and depiction of cultures in the movie (and your future projects) so this film can truly be the success we all want. We are interested, for instance, in how your ideal of including people from “all corners of the globe” correlates with your casting policies. Specifically seeking out white actors and casting four white leads for what M. Night Shymalan admitted was an “Asian fantasy world” does not celebrate ethnic diversity. Re-casting the sole villainous lead with an actor of color is a concession that results in three heroic nations going to war against an evil nation of color. · The outdated and discriminatory practice of casting white actors to depict Asian characters. · Casting calls indicating a preference for white actors for leads; people of color for extras. · Culturally ignorant language used by members of the production (e.g. DeeDee Rickets: “If you’re a Korean, wear a kimono” to the casting call). · The implications of featuring a villainous nation with dark-skinned, partly South Asian actors and a heroic nation led by white heroes who liberate the “Asian and African” nation. · Cultural appropriation of Pacific Rim cultures and the franchise’s core Asian concepts, despite a glass ceiling blocking off Asian American actors from playing lead protagonists. Thank you for your letter and interest in our film. As devoted fans of the original series, our goal is to create a film that will not only live up to the expectations of the television series’ fan base, but also expand it to a world-wide audience in ways that only a full-length motion picture can offer. From the outset of the creative process, the Producers and the Director have envisioned embodying the Airbender universe with a large and ethnically diverse cast that represents many different heritages and cultures from all corners of the globe. The Director’s vision for this film is one of world, influenced and inspired by the Asian undertones of the series, and that is both diverse and inclusive in the make up of the four nations represented in the film’s cinematic world. Early casting includes an Indian actor, born in Mumbai and raised in the UK and the US; a Persian actor born in Tehran and raised in the UK, Switzerland and the US; a Maori actor born and raised in New Zealand; a Korean-American actor, born and raised in Chicago; an American actress of Italian, French and Mexican heritage; among several others of varied nationalities from around the world. The four nations represented in the film reflect not one community, but the world’s citizens. These societies will be cast from a diversity of all races and cultures. In particular, the Earth Kingdom will be cast with Asian, East Asian and Africans. With this global perspective in mind, we believe we can best honor the true themes, ethos and fantastical nature of the Airbender stories and best capture the spirit and scale of the series to appeal to its worldwide fans. Our challenge and commitment to our film audience is to harness all the elements that have made the series the incredible phenomenon it is. We look forward to introducing you to THE LAST AIRBENDER next summer. Lots of people have contacted MANAA about the casting of the movie “The Last Airbender.” As a group we’ve discussed what the best way to join in these efforts. What follows below is a letter that MANAA sent to Paramount. This issue is not over. Stay tuned for more. I left two messages with you—one with your assistant Ricky on Monday and another with Lauren yesterday. I’m writing on behalf of the Media Action Network for Asian Americans (MANAA), which is dedicated to monitoring the media and advocating for balanced, sensitive, and positive depiction and coverage of Asian Americans. Since 1992, we have consulted with movie studios and met regularly with the top four television networks about ensuring diversity. We would like Avatar: The Last Airbender to become a successful movie trilogy. However, given the recent outcry over the lack of Asian/Asian American actors in the lead roles, we fear bad word of mouth may doom the first film before it gets off the ground and stop the potential franchise dead in its tracks. Indeed, the outrage over its casting has been greater than anything we’ve witnessed in the last several years. On Entertainment Weekly’s website alone, there are 78 pages of comments from people who feel a strong emotional connection with Avatar, and most of their responses are strongly negative with many threatening to boycott the film. Surely you have already seen or at least heard some of these concerns. 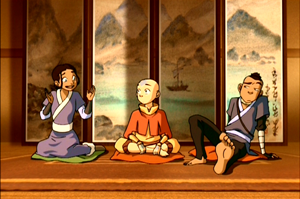 While the show Mike DiMartino and Bryan Konietzko created was a great success in creating a fantasy world inspired heavily by Asian and Inuit elements, M. Night Shyamalan chose Caucasian actors to play all four main characters. Recently, Prince Zuko’s character went to an actor of Asian descent, but otherwise, the only Asian presence in the film is in the sets and background characters. Compared to other shows, including many anime imports, Avatar: The Last Airbender was unique because it was created for an American audience yet used Asian faces for its main characters. We appreciated that the Nickelodeon series (with the help of Asian American consultants) was intelligent enough to avoid using many of the common Asian stereotypes—both positive and negative–often seen in the media, and that it even made strides in casting Asian American voice talent. The Asian American community, and the movie-going public at large, is used to seeing Asian men depicted as villains and rarely get the opportunity to see Asian heroes they can get behind and cheer for. This is also an historic opportunity to give Asian American actors a chance to shine in a big-budget film franchise which would bolster their careers for future projects. You will get deserved credit for launching those careers and can break down barriers by understanding that the audience that loved the television series is ready (and expects) to see Asian Americans playing those characters on the big screen. One of the reasons the Avatar television series was so well-received was that our former Vice President, Edwin Zane, served as its cultural consultant for the first two seasons and helped the producers avoid ethnic missteps. Likewise, please take advantage of us as a resource. We invite you to dialogue with us about the film so that it can really be something fans of the show (and potentially new future fans of the movie) can get excited about.